I came across Dutch artist Paula Arntzen via a press release for the new book, Paper Works, where her work is featured. 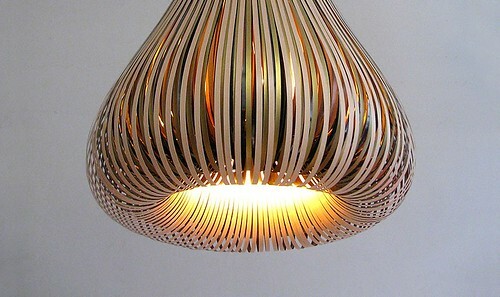 She experimented with paper to create a Paper Process series of bulbous, yet stylish handmade lamps that are composed of many layers of high quality paper, and some with copper foil strips. Paula's design studio is in Arnhem, Netherlands. She originally studied traditional furniture making and then product design, leading to objects that are both functional and decorative. Speaking of paper-themed books, Kayte Terry's Paper Made was recently released. It features a multitude of things to make with found papers - 101 to be exact! I'm finishing a wedding project this weekend and other than that it's wide open. I hope you have some exciting plans lined up - enjoy! hi Ann, love Paula's paper lamp and I look forward to viewing both of the new books featuring paperart. Thanks also for the Friday finds...I am wondering what edition is the Reader's Digest article that features Yulia's artwork? I also love the chevron paper folding technique...can't wait to give it a go. It's the newest issue of RD, Licia - not sure if that makes it June or July though. This is so beautiful and so are her other lamps on her site . So colourful and shimmery when lit. Hi Ann, thank you for taking the time to visit me! You are an asset to the crafting, especially quilling, community and I have long admired your work in publications and around the internet. Have a wonderful weekend! I keep on clicking the RSS feed button on your page, but it doesn't work!! Anyway, love your page. Thanks Eileen, that's so nice of you to say. Anon, the feed button is working for me, but it does take a little while to load. If you can't get it to work, you can sign up for email delivery of posts instead by clicking the little envelope next to the RSS icon. I love when you showcase artists' work. I had no clue that paper art goes so far and beyond cards and scrapbooking.